Welcome to Grand Hotel Terme Sirmione. This property is 3 minutes walk from the beach. Right in front of the lake and a few steps from the historical centre of Sirmione, Grand Hotel Terme features wellness facilities and elegant rooms with free minibar. Parking and Wi-Fi are free. The Grand Hotel's private spa features a Sala Relax, which is a living room with fireplace, lounge chairs, herbal-tea corner and direct access to the outdoor thermal pool. There are also a lake-view relaxation area and a gym. Fitted with wooden floors, spacious rooms at the Grand Hotel include a satellite flat-screen TV and air conditioning. Some rooms include a free daily newspaper. Most have a balcony or terrace, some with views of Lake Garda. Free internet terminals are available at reception. Overlooking the garden and the lake, the hotel's L'Orangerie restaurant serves international and classic Italian cuisine, for lunch and dinner. Breakfast is a full English buffet. This is our guests' favourite part of Sirmione, according to independent reviews. 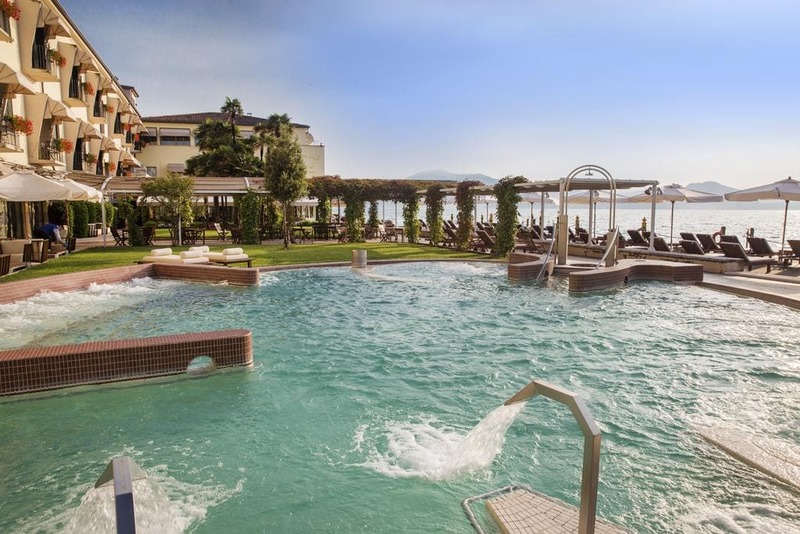 (Grand Hotel Terme Sirmione hotels).